In about a year and a half from now, the New Horizons Spacecraft will whiz past a distant Kuiper Belt object named 2014 MU69. This rocky relic of the ancient Solar System—which is located about four billion miles away—just passed in front of a distant star, resulting in one of the more extraordinary eclipses ever captured by scientists. Recording this eclipse, or occultation as it’s more formally known, was no accident. 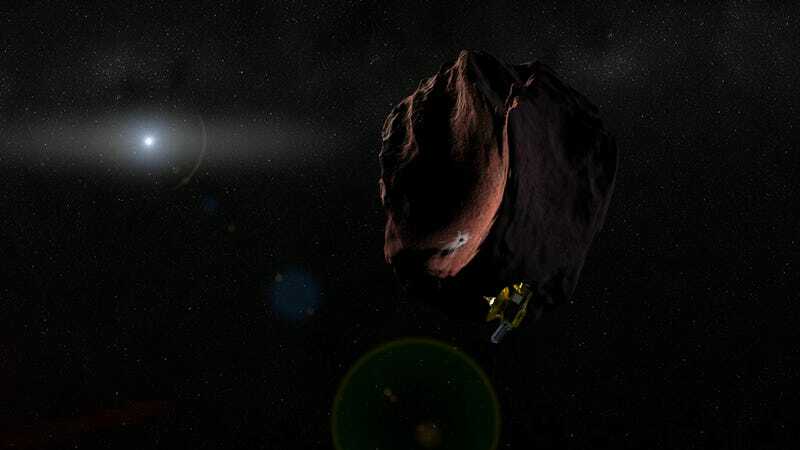 The New Horizons scientists who led this mission knew that MU69, a Kuiper Belt object measuring about 20 to 30 miles in diameter, would pass in front of an unnamed star during the early hours of July 17th. Mark Buie, an astronomer at Southwest Research Institute (SwRI) in Boulder, Colorado, led a team of 60 observers who helped to deploy two dozen mobile telescopes in a remote region of of Chubut and Santa Cruz, Argentina. The scientists were hoping to spot the shadow of MU69 as it moved in front of the star—an event that would last for a mere 200 milliseconds. Incredibly, the astronomers managed to capture not one but five occultations of MU69. The eclipse didn’t last very long, and the resolution was exceptionally low, but the researchers will now pore over the data in an effort to learn more about the size, shape, orbit, and environment around MU69. 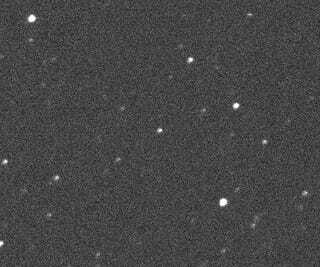 On January 1, 2019, it will become the most distant object ever visited by a spacecraft when New Horizons briefly checks in. This ancient object is poorly understood due to its relatively small size, dim complexion, and extreme distance. Late last year, observations made by the Hubble Space Telescope suggested MU69 is red, and possibly redder, than Pluto—the dwarf planet visited by New Horizons on July 15, 2015. Astronomers measure and detect distant exoplanets passing in front of their host stars all the time (called the transit method), but catching this occultation in the act—an event involving a very small Solar System object at an extreme distance—is nothing short of remarkable. And indeed, Buie said the occultations made earlier this week wouldn’t have been possible without the help of Argentinian scientists, government officials, and locals—many of whom went beyond the call of duty. On the night of the occultation, a major national highway was shut down for two hours to keep car headlights away, and street lights were turned off to reduce lighting. And because fierce winds were a problem, some volunteers even parked their trucks near the observatories to serve as wind breakers. It’ll take a few weeks for scientist to analyze the new data, so hopefully we’ll have more to say about the shape and size of MU69 in short order. New Horizons Locks Onto Next Target: Let&apos;s Explore the Kuiper Belt!